Kishari Sing, the Food Allergy Queen, is a food blogger, former caterer and marketing executive who discovered in 2003 that her lifelong health issues (asthma, insomnia, migraines, fatigue, skin problems, joint inflammation) were due to a long list of multiple food allergies. She started her blog, FoodAllergyQueen.com, because when she explained that she had multiple food allergies to people (including her mother), inevitably the next question would be “So, what in the world DO you eat?” In response, she started documenting everything she ate, to include her own cooking and out of the home. A lifelong foodie, Kishari was determined to avoid feeling deprived in managing her multiple food allergies, as well as create dishes adaptable enough to feed her non-allergic boyfriend as well. 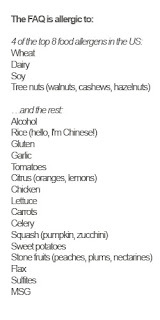 She discovered that most of the allergy cookbooks she encountered substituted one allergen with yet another allergen (i.e. rice for wheat, soy milk for dairy), making them practically useless for her multiple food allergies. 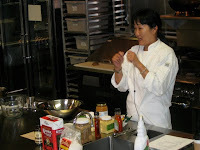 Kishari got creative and applied classic French cooking techniques as well as ethnic and alternative cuisines (Middle Eastern, Jewish, vegan) to develop recipes and techniques for dishes to be delicious and flexible enough to avoid all eight of the top U.S. food allergens: wheat, dairy, soy, eggs, nuts, peanuts, fish and shellfish. 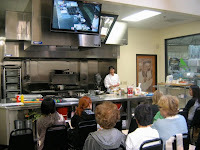 Based on her food allergy cooking experience, Kishari was invited to teach at the Surfas Restaurant Supply and Gourmet Food, and at the New School of Cooking, both in Culver City, California, to share her tips and techniques on how to cook for multiple food allergies. She continues to develop recipes, share research and develop a community along with other food allergy bloggers to share her knowledge of the range of subjects (cross-contamination, IBS) related to food allergies. According to The Food Allergy and Anaphylaxis Network (FAAN), there are currently 12 million Americans suffering from food allergies. It has been reported that more and more children are being diagnosed with severe food allergies, and parents are also discovering that gluten- and dairy-free diets help ease symptoms of autism and ADD/ADHD. Additionally, Celiac’s disease, a potentially life-threatening disorder from a severe allergic reaction to gluten, is on the rise and the food industry has taken notice by providing more gluten-free products. It’s safe to assume that many adults, and especially parents, are constantly at a loss at how to keep themselves and their families allergy safe while still providing them good-tasting food.